Ravensburger 9676 - Two Challenges in One! 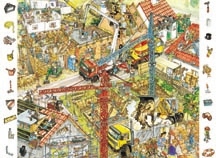 Complete the 84 piece puzzle and then search for the hidden pictures inside the puzzle. A great way to boost concentration. Finished puzzle measures 19.3" x 14.3".